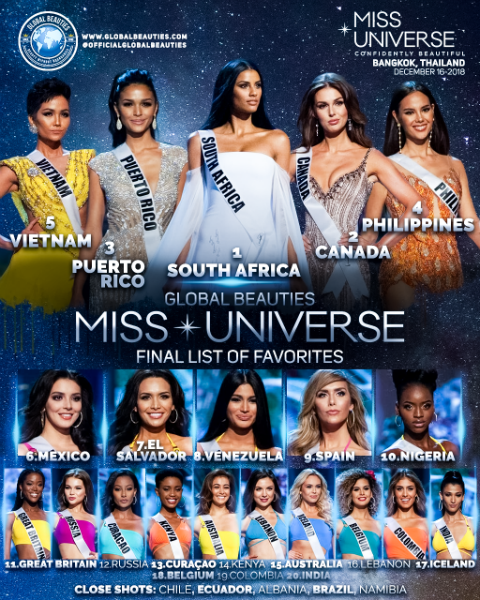 Our final List of Favorites for Miss Universe 2018 is the result of the combination of opinions from pageant observers and GB contributors who have listed their Top 20 favorites in order of preference. Miss South Africa appears on Top, just like last year, when GB got it right. Can a back-to-back victory take place on Monday morning in Bangkok? Though Uruguay appeared in 1st place in Isa´s list, it did not make it to GB´s list: this was her only mention. If Richard Isa bets some money on Uruguay and she emerges as the winner, he could become a millionaire! Albin Beart (India): 1-Philippines, 2-El Salvador, 3-Curaçao, 4-Canada; 5-Puerto Rico. Andre Sleigh (GB, South Africa): 1-Philippines, 2-South Africa, 3-Canada, 4-Russia, 5-Puerto Rico. Henrique Fontes (GB, Brazil): 1-South Africa, 2-Philippines, 3-Vietnam, 4-Canada, 5-Kenya. Jean Marie Vandercasteele (Belgium): 1-El Salvador, 2-South Africa, 3-Zambia, 4-Spain, 5-Argentina. Marjukka Niemenen (Finland): 1-South Africa, 2-Puerto Rico, 3-Philippines, 4-Venezuela, 5-Mexico. Ricardo Guiraldes (Chile): 1-Puerto Rico, 2-South Africa, 3-Ecuador, 4-Canada, 5-Vietnam. Richard Isa (Curaçao): 1-Uruguay, 2-Australia, 3-Spain, 4-Venezuela, 5-Indonesia. Rafael Duarte (Brazil): 1-Lebanon, 2-Russia, 3-Canada, 4-Colombia, 5-Albania. Sally-Ann Fawcett (United Kingdom): 1-Puerto Rico, 2-South Africa, 3-Philippines, 4-Canada, 5-Vietnam.